Kowa Product Come With an Objective Lense Made of pure Fluorite Crystal. A mysterious stone called fluorite emits light like a firefly when it is heated or exposed to ultraviolet radiation. Chemically, it consists of fluorite (F) and calcium(Ca), comprising a stable halogenide mineral (CaF2). Natural fluorite contains trace amounts of rare earth elements, giving the stone a greenish or purplish color and causing it to emit fluorescence in response to heat or ultraviolet radiation. The fluorite used in lenses is an artificially made monocrystal. Therefore, it does not contain any impurities, nor does it emit fluorescence when heated or exposed to ultraviolet rays, but it is a highly uniform and clear lens material. Artificial fluorite is chemically stable, and it is easier to make relatively large crystals of very high quality from it. However, since fluorite takes the form of a monocrystal, it has the shape of a regular octahedron, and thus tends to chip. In addition, fluorite can be easily scarred. Therefore. great care is required when grinding and polishing such a crystal into a lens. Then, why is fluorite, which is so difficult to handle in processing, used as an optical material? One of the major causes of deterioration of viewing quality with telescopes is color blur (chromatic aberration). The degree of refraction of light changes according to the color (wavelength). The degree of such refraction is called "dispersion". The focal length of a lens varies slightly according to color, generating a red or purple blur along the outline of an image. 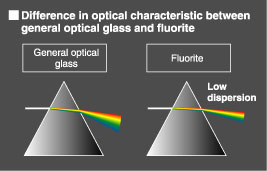 Normally, combinations of two or more types of optical glasses with different dispersion properties are used to compensate for one another and reduce color blur. Nevertheless, this blurring cannot be completely eliminated even when using hight quality optical glasses. Fluorite is the key to eliminating color blur. Fluorite has an outstanding feature of very low dispersion that cannot be found in optical glass. This characteristic enables us to eliminate color blur almost completely, Elimination of color blur dramatically improves resolution and contrast. As a result, subtle colors and shapes of wings of wild birds, slight changes in color of dark objects set against back lighting, bright star clusters, or details of the moon or planets can be observed as clear and sharp magnified images. Fluorite lenses may even lead us to new discoveries beyond our previous observational capabilities. Since fluorite is considerably more difficult to handle than optical glass, it requires highly advanced processing techniques. 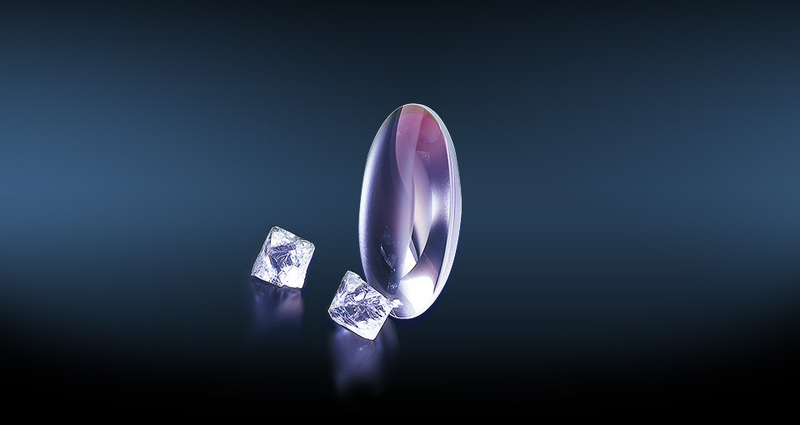 At Kowa we put forth extra care, time, and technique to produce a highly valuable fluorite crystal lens. The large amount of time and care that we spend guarantee that you will get the highest levels of viewing quality. XD lens:Optical glass with extra low dispersion. Also called ED, HD, SD, UD or LD lens. The lens has been developed as an alternative material to fluorite crystal. XD lens can reduce chromatic aberration, although to a lesser extent than with fluorite crystal. The word "fluorite" is sometimes used to mean optical glass containing fluorite component (fluorite glass). The XD lens is made of fluorite glass. At Kowa, the name "fluorite" is only used for pure fluorite crystal.